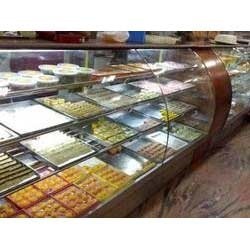 With the constant support of our expert team, we are engaged in offering a huge assortment of Display Counter. This high grade Display Counter is widely demanded in the international markets for its high durability, optimum performance and reliability. With the constant support of our expert team, we are engaged in offering a huge assortment of Steel Pick Up Counter with 2 Under Self & 2 Over Head Shelf. We bring forth an impregnable range of Pick up Counter with 2 under self & 2 Over Head Shelf. 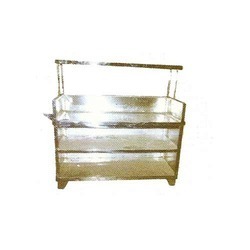 This high grade Pick up Counter with 2 under Self & 2 Over Head Shelf combines aesthetics with optimum utility. Being very easy to use and operate, these are available in market in standard sizes. Banking on our enriched industry experience, we are engaged in offering a huge gamut of Service Counter. It is used for keeping the food warm for a longer time and to serve on instantly. 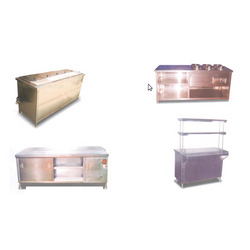 We take into account the prevailing trends and parameters set by the industry and offer suitable range of Service Counter. Our highly experienced and professional workers make use of sophisticated tools and machinery to fabricate this Service Counter. This Glass Display Counter is perfect for use in restaurants, shops and fast food centers. It is used for keeping the food warm for a longer time and to serve on instantly. Our Display Counters are widely demanded in the international markets for its optimum performance, reliability and durability. We have highly experienced and professional workers that make use of sophisticated machinery and tools to fabricate our display counter. These counters are clean and very affordable. Looking for Display Counter ?